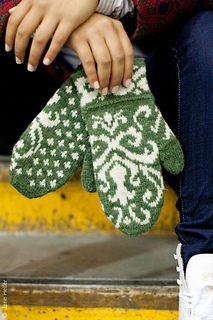 Classic mittens made with Fair Isle-style stranded colorwork. 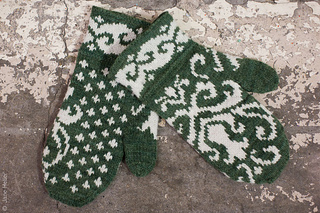 Construction Notes: Worked in the round on double pointed needles, these mittens begin with a turned hem at the cuff and feature a scrolling flourish design in Fair Isle-style stranded colorwork. 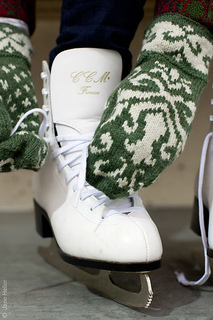 The pattern is presented in chart form only. 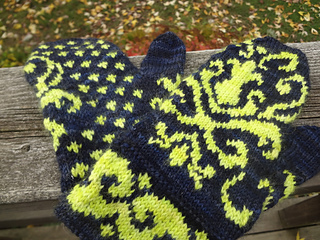 Page 3 - On the Right Mitten Chart, the last stitch on rows 50 and 54 should be a k2tog.